Okay so this za’atar dressing is my new favorite thing. Ever. I’ve been making it almost everyday since I developed this recipe. If you’ve never tried the Middle Eastern spice, za’atar, you are in for a treat. You can buy the blend, or make it yourself. I use this blend. They sell it at New Seasons here in Portland, the place where I do all my shopping, but if you can’t find it at your regular store, try a Middle Eastern market (or just order it online). This dish makes a delicious light, healthy dinner or can be served as a side dish. Try the dressing on salads and other rice or quinoa bowls, too. 1.) Preheat the oven to 400°. Cook rice according to instructions on package. I cook the wild rice blend with veggie broth instead of water for added flavor. 2.) Rinse the lentils with cold water and discard any stones. 3.) Put the lentils in a large saucepan or Dutch oven and fill with enough water so that the lentils are covered by 3-4 inches. Add a couple of sprigs of mint and the bay leaves. 4.) Bring the lentils to a boil then reduce the heat to a simmer, add a few pinches of salt and cook for 20-25 minutes. The lentils should be tender, but not overcooked. 5.) Wash the carrots and remove the tops. Toss them in 1-2 tablespoons of avocado oil (or any oil you use for roasting) and the juice from half a lemon. Salt and pepper to taste. Spread the carrots on a baking sheet and roast in the preheated oven for 30-35 minutes, until the carrots are tender. 6.) While the carrots are roasting, lentils are simmering and rice is cooking, make the dressing. Mix together the olive oil, shallot, za’atar, lemon juice, salt and pepper. 7.) Drain the lentils from the water once they are done cooking. Remove carrots from oven. 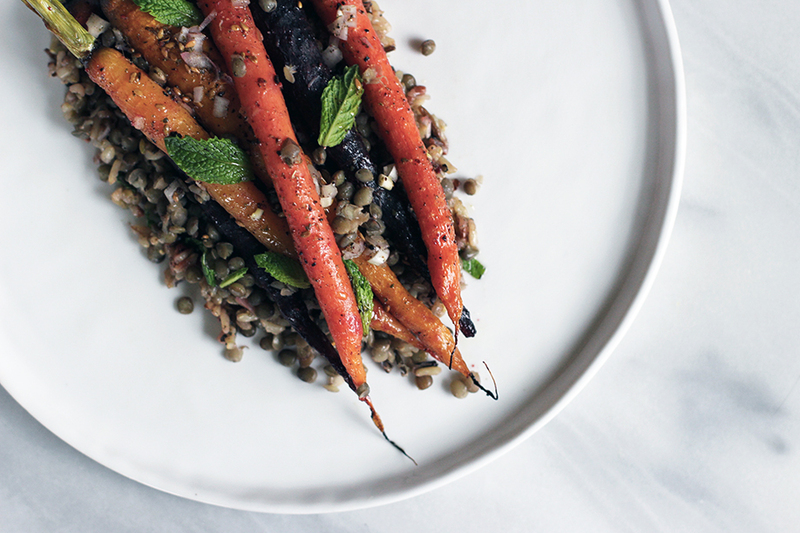 Serve carrots over a bed of the wild rice and lentils. Pour the dressing over each dish before serving. Garnish with fresh mint.